118/159 David Mumpower Jeremy Irons tries, God love him, but this is a mistake. The casting department wanted to find another Hayden Christensen. Be careful what you wish for. 127/200 Max Braden I thought Dragonheart was silly, and it's better than Eragon. Christopher Paolini started working on his novel Eragon when he was just 15-years-old, and utilized such influences as J.R.R. Tolkein, Terry Brooks and Anne McCaffrey. Now that story will be turned into a movie that will hope to capitalize on the young adult demographic that has enjoyed the Harry Potter films. Eragon is a young farm boy who discovers a gorgeous blue stone up on a mystical mountain. Although he plans to trade it for food to help get his family through the impending difficult winter, a beautiful sapphire-colored dragon hatches from it - a creature previously believed to be extinct. Eragon and the young dragon become fast friends. 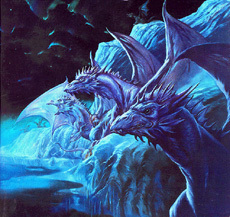 See the latest developments for this project on the Eragon Movie News page.